Heartfelt wishes for the New Year. 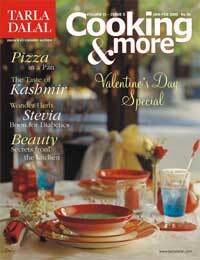 I hope 2005 brings you lots of love, luck and happiness.This issue is a Valentine’s Day special. The beautiful emotion called love demands celebration. We hope you have loads of warm memories of the occasion with ideas and tips from Cooking & more. You will find an elaborate flower arrangement, an easy to make gateau, delightful candles and a detailed Italian menu that will bring a smile on your Valentine’s face. As part of our efforts to keep updating and expanding our horizons, we have started a new section called ‘Enterprising Entrepreneurs’. This section will deal with how you can give wings to your ambitions. We will introduce you to those who have started a business from home and become successful at it. May God grant you a lifetime of togetherness. Happy Valentine’s Day!